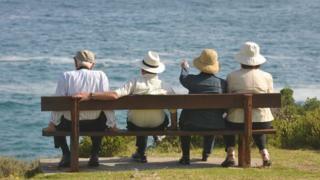 Older people would be entitled to current levels of state pension in an independent Scotland, according to the UK pensions minister. Steve Webb told a Westminster committee those who had "accumulated rights" would be entitled to the money. However, he said there were still questions over which government would pay the money. SNP MSP Kenneth Gibson said the comments confirmed that pensions would be secure in an independent Scotland. Asked by Labour MP Ian Davidson at the Scottish affairs committee whether people could be assured that their pensions would be secure if Scotland votes for independence in September's referendum, Mr Webb answered: "Yes, they have accumulated rights into the UK system, under the UK system's rules." He added that the money would be paid out at the pension age decided by the UK government, rather than any future Scottish government. He said: "Take a Scottish person who works all their life and then retires to France... they still have an accumulated pension right in respect of the National Insurance they have paid in when they were part of the United Kingdom." Asked whether citizenship would matter, Mr Webb told MPs on Tuesday: "Citizenship is irrelevant. It is what you have put into the UK National Insurance system prior to separation. Answer [for example] 35 years, that builds up to a continued UK pension under continuing UK rules. They are entitled to that money. The question is, who is paying for it, and how is that [cost] split?" Mr Davidson said that would be a "matter of haggling and process" in the event of a "Yes" vote. In response, Mr Gibson said Mr Webb's comments had "made Westminster's position crystal clear". He added: "The confirmation from a UK government minister that pensions will be secure in the event of a Yes vote puts an end to No camp scaremongering on the issue once and for all. "The No camp's credibility on pensions is now beyond repair as their attempts to scare pensioners into voting for the status quo have now been laid bare for all to see." Elsewhere in the session, Mr Webb claimed an independent Scotland could face sudden tax increases or cuts in spending to deal with economic volatility. He said: "For example if you have a sudden downturn, across the UK, the economy as whole can absorb that. So taxes don't suddenly have to go up or benefits don't suddenly have to be cut. You can take the long term view."